What do you think? Are people by nature good or bad? Wait! Before you answer, consider that this is a centuries-old debate. People with credentials may speak with authority when they give their opinion, but it's still just their opinion. Opinions don't resolve debates, they tend to polarize the debate. An important part of the discussion, if you want to move beyond mere debate, is to define terms. What's the basis for goodness? How do you define human nature? What are we told about people in general and the value of wisdom? What advice is given about what people say, and what is the basis for this advice? What did King Solomon find out in his search for wisdom and reason for life? 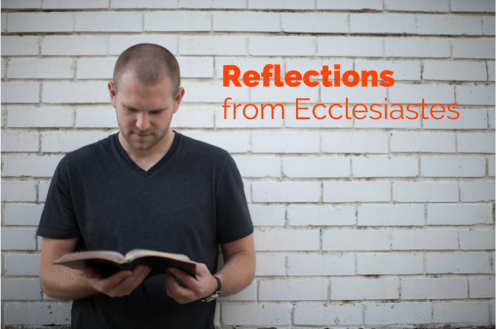 What was Solomon still looking for, and what did he learn about God and people? An opinion is a belief based on a subjective point of view. Why is it subjective? Because it's a personal point of view. In the very beginning of humanity, when God created the universe, it was all good. Not good in the way that expression is used today. Everything created was genuinely good, pristine, and in right order. God is the only true standard of goodness. However, the world around us is no longer in pristine condition, regardless of your opinion on climate change. And, the population of the world does not live in harmony with one another or their environment. Our view of people and life in general is jaded. It's jaded because we have a hard time seeing beyond ourselves and our own point of view. Solomon was onto something when he said— God made people good, but they have found many ways to be bad (verse 29). What is your view of human nature, God, and goodness? What do you base this on? If you've been living for a while, how has your view of life and human nature changed? What areas in life are you still seeking answers? What are you sure about? Why? Where do you seek wisdom? How has the wisdom you've gained in life helped you?